Dreaming of a lush lawn? The trick to successful sowing is a clear understanding of your type of grass and the climate it thrives in. Q: I’d like to lay some grass seed this year, but I don’t want to get the timing wrong and create more work than necessary. 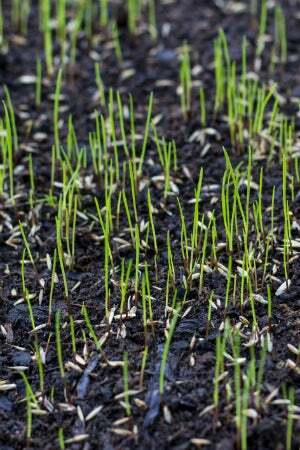 What’s the best time of year to sow a new lawn from scratch? A: More than anything else, when to plant grass seed depends largely on the climate in your part of the world and the types of grasses that thrive in them. 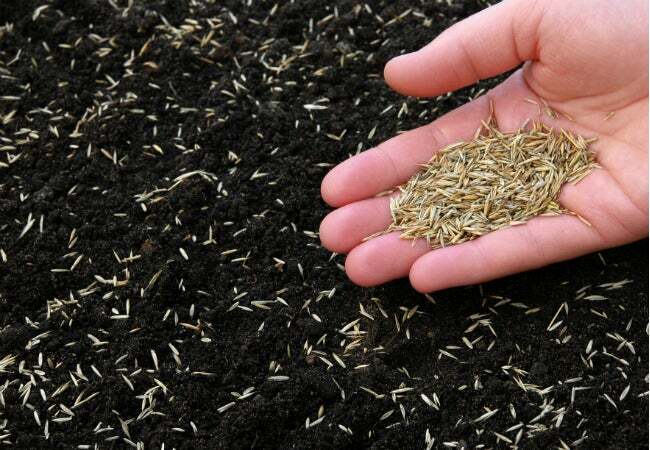 Grass seed generally falls into two categories: warm-weather and cool-weather varieties. Each of these varieties requires different maintenance and—you guessed it—minimum sowing requirements to grow good-looking grass. ● Cool-weather grasses such as bluegrass and ryegrass, on the other hand, fare best in places where summers are temperate and winter days often dip below freezing. Requiring more hydration (often delivered via snowfall), these varieties lie dormant in warmer summer months and do most of their growing in autumn and spring. September is typically when to plant grass seed for cool-weather varieties, although you might be able to get away with seeding as early as mid-August or as late as mid-October. The deciding factor, here again, is temperature: When temperatures begin to dip below 60 degrees, evaporation rates are lower and irrigation is more efficient. ● If you live in an area that falls between those two climate zones, you’re in what’s considered a transitional region. Cool-weather grasses (with late summer/early fall preparation) are more likely than their warm-weather cousins to flourish in a zone that falls in between the extremes, but homeowners in these zones may well plant a mix of both—cool-weather grass sown in late fall and warm-weather planted during the spring and summer months of the following year. You may also take your neighborhood’s altitude into consideration as well. Some local research via the USDA’s recommended university extension programs might benefit you if you’re in a vertiginous area, for example, and looking for a safe choice. Otherwise, consult the professionals at your local home and garden center for best bets. Time when you plant grass seed well after you’ve last applied herbicides. Ideally, you’ll want to wait at least a month after chemically treating your existing lawn for weeds before you lay down new grass seeds. If you’ve used a crabgrass prevention product, though, the recommended waiting period is even longer—usually around four months. Ideally you plan your lawn maintenance well in advance so that you can wait out the appropriate amount of time before your part of the country sees ideal temperatures for seed germination. If you didn’t save yourself enough time to weed before seeding, know that you can safely resume your weed prevention routine once your new lawn has been mowed at least four or five times. Scheduling your seeding depends on when you have the time to prep the soil. As the time for seeding draws near, allot a weekend on your calendar for a bit of prep work. Starting with bare ground? Loosen the top two inches of soil, remove any materials (i.e. sticks and stones) that could block airflow. Otherwise, if you’re working with an existing lawn that just needs some rehabilitation, take the weekend to mow it as short as you can and loosen up the soil in any bald spots. Then, no matter whether your lot is bare or simply balding, inspect that the surface is as level as possible and add fresh topsoil wherever it dips; this helps prevent puddles of standing water once you begin the irrigation process. With this prep work under your belt, you’re ready to begin sowing grass seeds—and soon—enjoying a lush lawn.